Carol Bosshard (r) and Celeste Murphy (l) met when their daughters attended preschool together in Louisville. They quickly discovered they had many shared interests. Though their girls moved on to separate schools and friends, Celeste and Carol’s friendship continued to grow. It was during one of their many gorgeous local hikes that they began to talk about opening a yarn shop. At first the idea was to create something small and part-time, but things quickly knit up to become FingerPlay Studio. 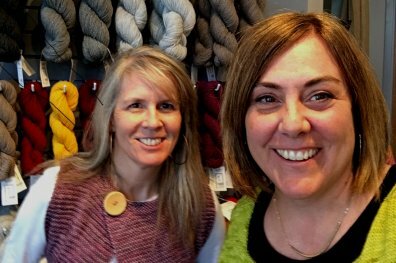 The name of the shop conveys Carol and Celeste’s philosophy that everyone should consider play an essential part of living. It is through play that people learn, develop creativity, and connect with others. FingerPlay Studio offers a place where people of all ages, interests and abilities can come together to support each other in exploring their creative nature. What does FingerPlay Studio offer? FingerPlay Studio offers well crafted supplies for knitters, crochet enthusiasts, and fiber artists. Product offerings are chosen to fit a variety of tastes and budgets. Classes and special events are all designed to encourage those new to fiber arts and inspire experienced crafters. If there is something you would like to see us offer, we welcome your suggestions.